Don’t let the title of this post with the big ‘C’ word in it scare you off, I know Halloween hasn’t passed yet. But in card-maker and blogger world you just have to be on these things if you want to get all your projects done before the the big guy is on your roof top. Today I have a special early Christmas present for you, a small batch of pretty handmade Christmas Card Ideas, made with some beautiful May Arts Ribbon! 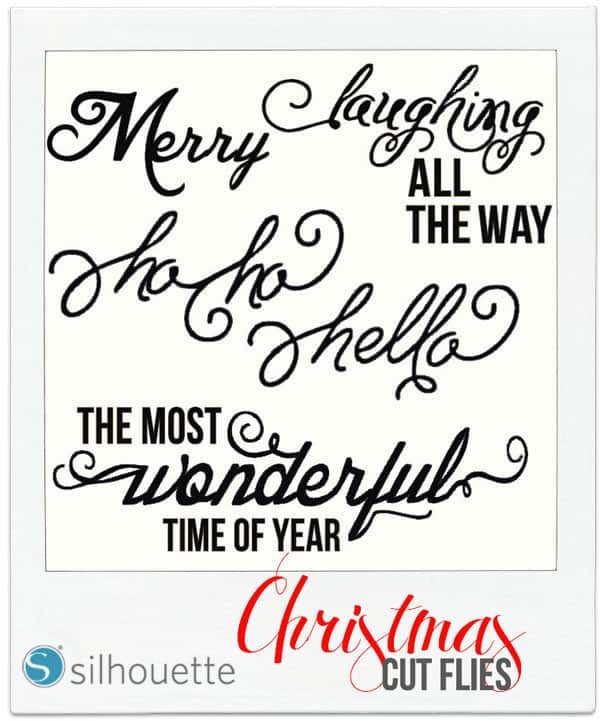 … and if you’ve been a really good girl at the end you can also grab the FREE Silhouette cut files for these fun Christmas Phrases! 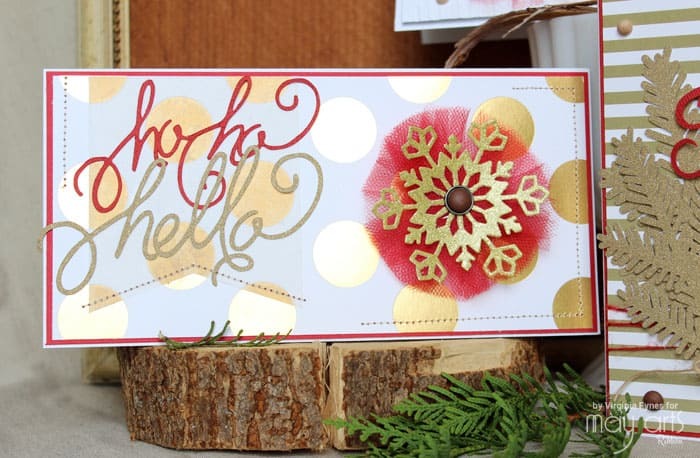 I love the red and gold combination with a few hints of natural colors and elements. The May Arts Ribbon tulle pairs perfectly and give a feminine pop! 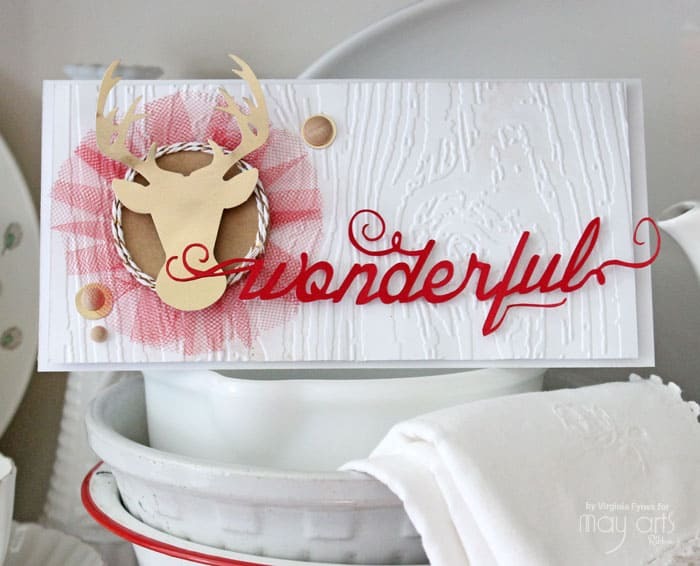 The burlap string in the card above is one of my favourite ribbons, so many uses. I would typically use tulle for sewing so it was fun to put it to use on some Christmas cards. 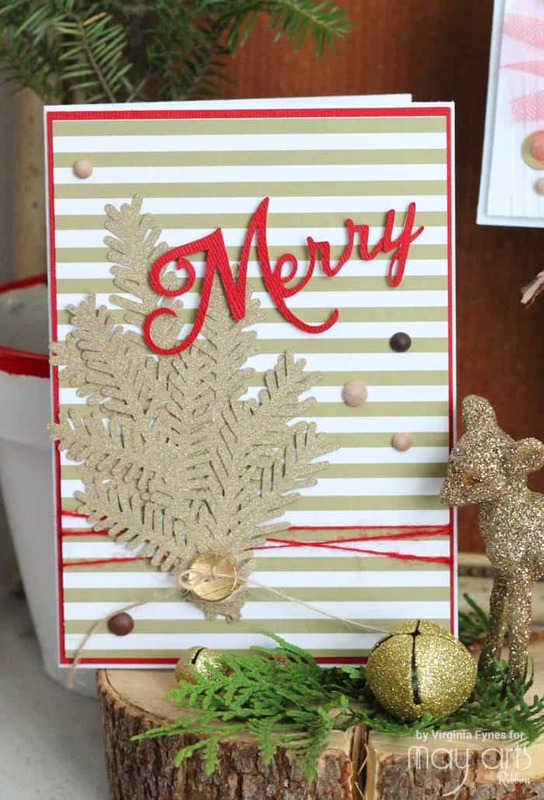 Want more Christmas card ideas and Inspiration to kick of your holiday card making? It is amazing how the tulle adds to the card and the cut files are great. Could these also be used on the Cricut? Love the use of tulle on the cards! These are great, love the use of the tulle. Beautiful cards! I love that burlap string and I love the idea of using tulle on cards! The cards are beautiful. So bright and sparkly. Beautiful cards love the layering and the colors. thanks for sharing. Lovely cards. I like the use of the tulle behind some of your elements, it really does stand out. Thanks for sharing the ideas with us. Fabulous cards! Love May arts – have worked with them for many years through Coredinations and Love their products! I love the simplicity of your cards with the focus on the ribbon. 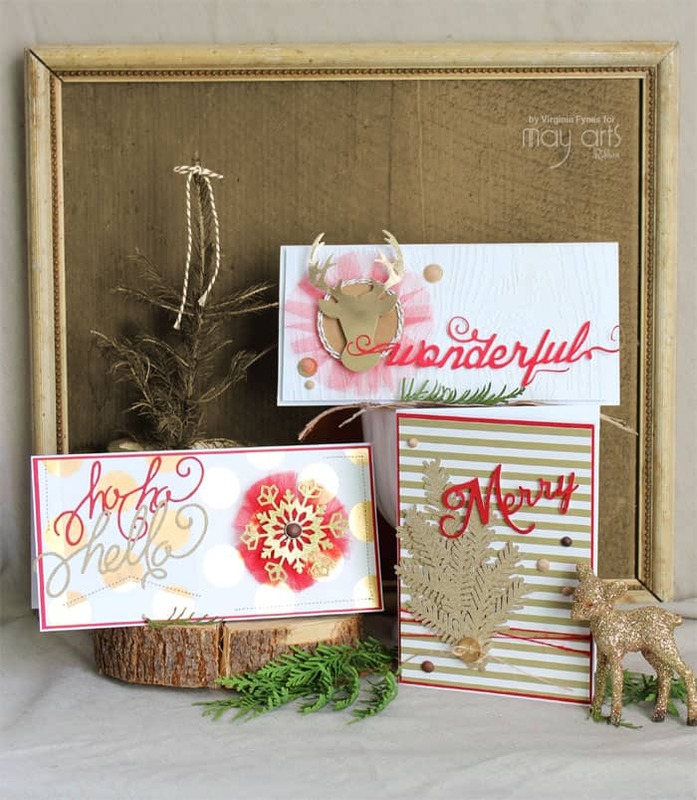 Pretty cards – may favorite is the hello card. I love your style! These are classic Christmas to me. Gorgeous cards! Love those cut files! Virginia – These are amazing! I love them. Thanks Tara, you’re too sweet! Tulle on cards? What fun! I’ll bet Mr. Reindeer is feeling very special. Wow! I love your cards! The tulle and the burlap string really adds some special touches to them, too! love the tulle on the cards! What great cards, some good ideas here. Thanks for the cut file. LOVE them all…especially that reindeer…LOVE the tulle! Wow stunning cards! Thx for sharing! 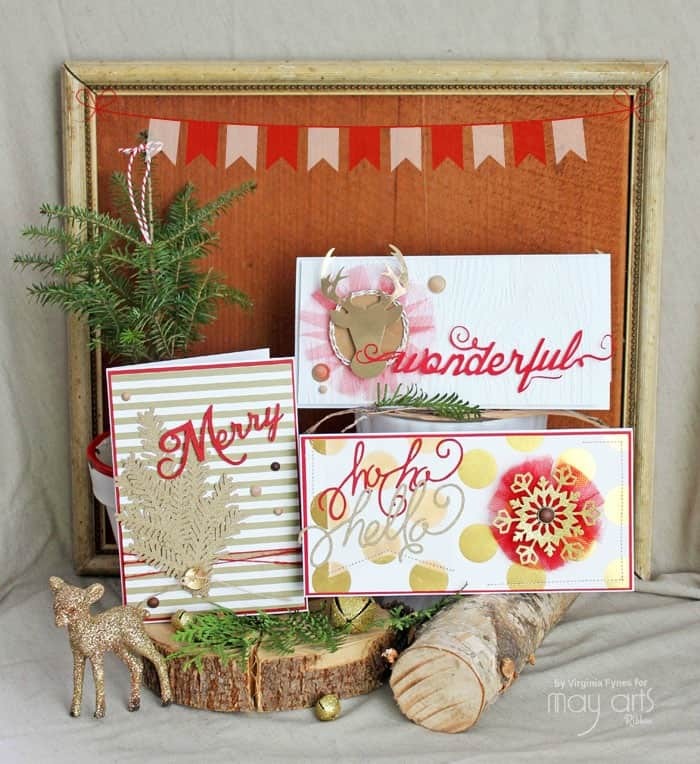 Wonderful cards, love the style, the gold and red are perfect together. TFS. Great cards. I really like the use of the red tulle. LOVE the red & gold, LOVE the tulle, LOVE burlap string, LOVE the sparkle, LOVE the textures, LOVE them ALL!!! THANK YOU for sharing your creative Christmas inspiration and cut files too 🙂 I’ve pinned your cards for inspiration, hoping to add some tulle to my cards this year!! !